The majority of the world's newest metro stations are located in China. 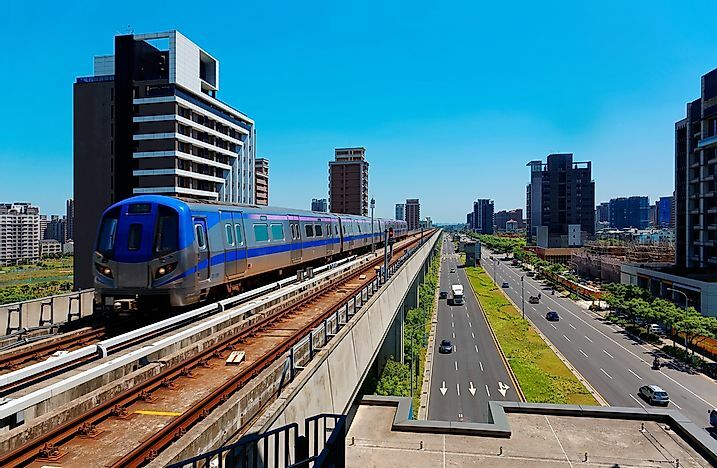 The metro system of Taoyuan, Taiwan opened in 2017. Metro systems are designed to transport masses faster and efficiently. They link residential areas, cities, airports, and suburban areas. Fifteen of the twenty-five metro systems constructed in the five years leading to 2019 are located in China. The rapid growth of metro systems in the country is necessitated by the large population and the need to move masses faster without creating traffic jams. These are the newest subway systems in the world. The Jinan Metro, Wenzhou Metro, and Noida Metro were all opened in January 2019. The Jinan Metro system began operation on January 1, 2019 in Jinan, China. Construction began in December 2013. Line 1 (R1) runs over 26 km from Fangte, Huaiyin District to Gongyanyuan, Changqing District with 11 stations throughout the western part of Jinan city. A further 95.6 km are planned with the construction of Line 2 (R2) and Line 3 (R3). The Wenzhou Metro system serves the city of Wenzhou, China. Line 1 (S1) opened in January 2019 running from Tongling, Ouhai District to Olympic Center, Longwan District with 12 stations and a total length of nearly 35 km. In total, six lines with a total length of nearly 362 km have been proposed. The Noida Metro system runs nearly 30 km in Uttar Pradesh, India connecting the cities of Noida and Greater Noida. Noida is a planned city under the management of the New Okhla Industrial Development Authority (NOIDA). It is part of the National Capital Region. The single line has 21 stations. The Noida Metro was inaugurated on January 25, 2019. The majority of the metro systems are in Asia, apart from China, India and Iran are also developing metro systems. Population growth and economic development are some of the key factors that have necessitated their construction. They are considered a more efficient and effective method of transporting masses from one point to another without congesting the roads.